Edith was brought in to deal with "fallen women"
A Lincolnshire museum is celebrating 90 years since the appointment of the first policewoman in Britain. 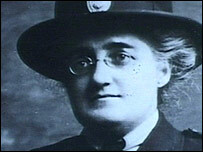 Edith Smith joined the Grantham force at the height of World War I, the first female officer to have full powers of arrest. Mrs Smith's role was in part prompted by the billeting of 14,000 soldiers in the area, which led to an increase of prostitutes and related trouble. But despite long hours she left in 1918 and died of an overdose soon after. 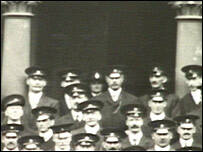 A small group of uniformed volunteers had been formed to patrol parts of London in 1914, but Edith Smith was the first female officer to have full police powers. David Vale, from Grantham Museum, said: "The army camp attracted the women of ill-repute and it was up to Edith to sort them out. "She was a caring person, she tried to deflect them away from bad behaviour rather than going around arresting them. But if was necessary she did arrest them!" One report sheet for 1917 gives a flavour of her duties, recording "Foolish girls warned", "Prostitutes sent out of Grantham" and "Soldiers' wives visited, some cautioned and others had allowances stopped". Karla Bullimore, who has been a police officer in Grantham for three years, said: "Not only is her uniform different but she worked in a different world. "There are so many more female officers today, so not only are you not alone but you are treated just the same as the male officers." Edith left the force in 1918 after working seven days a week for two years. Five years later, she took a fatal dose of the pain-killer morphia. She is still held in high regard in the town, not only with the display in the museum but a road also bears her name. The jail where she worked is now the arts centre box office.